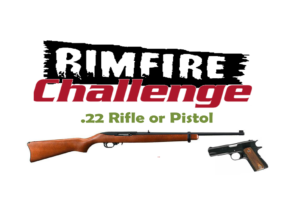 Rim Fire Challenge (Last Saturday of the Month) | Blue Ridge Cherry Valley Rod and Gun Club Inc.
Blue Ridge Cherry Valley Rod and Gun Club will be holding monthly Rim Fire Challenge matches on the last Saturday of each month starting on April 28th and ending on October 27th, 2018. Since this is a beginners type match, every one over the age of 10 years old is invited to shoot. (parent or guardian is required for minors) Sign ups will be handled using Practice Score, or you can sign up at the door. Cost is $20.00 and includes lunch. Match times are, set up starting at 8:00, Registration at 10:00, Hammer down at 11:00, and the match should finish around 2:00. The matches will consist of 4 Pistol stages and 2 Rifle Stages. Competitors under the age of 17, shoot for free.